After a wet start, the weather cleared up just in time for the arrival of 7 volunteer diggers, mostly from Brighton and Hove Archaeological Society. Access was made much easier for us, for Natural England has now inserted a small wire gate into the fence, for which we are very grateful. Damaged west wall of house. Having already dug the centre of the west side of the house last Sunday, we split into two groups, following the west wall of the house – searching for the returns to this wall – and we found them! It seems we were lucky last week, for the quality of the surviving archaeology towards the gable ends of house wasn’t quite as good as that in the middle. It may be that the WW2 shell damage demolition rubble was deeper in the middle of the house and so protected it from the bulldozer, which cleaned up the site in the early 1950’s. No more than a single course of the west house wall has survived above the old floor level. Its construction was of flints on the outside and header bonded brickwork on the inside. Alternating courses of headers and stretchers are characteristic of English bonded brickwork. To the south of the house, on maps on and after 1898, a new extension is visible. Sadly the outside wall starts dipping down quickly where it has either been cut by WW2 artillery shelling, or the later bulldozer, so it is not yet clear whether there will be any sign of it in the archaeology. However, the original turn of the wall has been found, and immediately before that turn the imprint of a frogged brick in the mortar is clearly visible. Only one other frogged brick has been found on site. All others were frogless. The frogged brick that made this imprint almost certainly belonged to a later phase of construction and, as yet, is our only archaeological evidence of the extension. However, both Phippses and Lathams recall a sort of lean-to conservatory on the western half of the south gable end. Since last week further memories of the oldest surviving Phipps and Latham ‘children’ were sought, and they confirmed both the coal store and pantry, the latter having a window which looked out onto the farmyard. The Lathams possessed some sort of an iron stove, whose lid we may have found on the north end of the rubble mound. 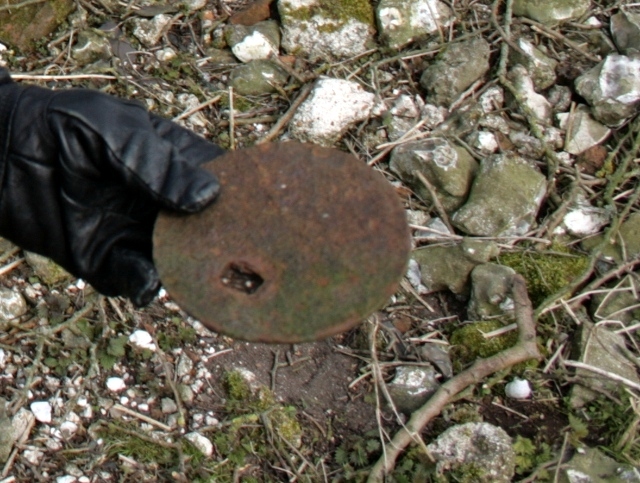 Cast iron lid of stove found on surface of rubble mound. At the front gable end of the house the NW return to the wall was also found. A short distance to its north the metal detector found something with a strong signal which registered as having a non-ferrous component. 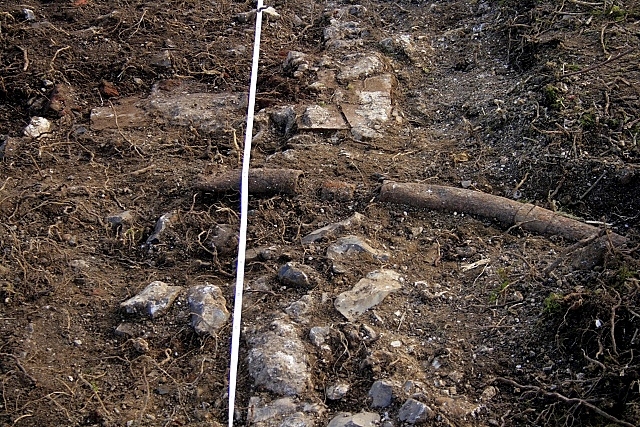 Since such a signal could be from unexploded ordnance it was very carefully excavated, but fortunately it turned out to be rusty drain pipe. If it is in-situ it could have topped up a possible well, which the Lathams recall as being in front of their kitchen window, from rain water collected from the nearby barn roof. Or it might have fallen from the side of the house. Only further excavation will resolve this intriguing feature. Rusty drain pipe to NW of house. We have also aroused the interest of a number of walkers, some of whom came over to have a chat about what we were digging, and also about the history of this part of the South Downs in general. This project is not just about the digging of a 19th century farm labourer’s cottage, it is also about the interpretation of what we find and the communication of the results to as wide an audience as possible. Needless to say, there is still a lot more to dig, and – I am sure – a lot more stories to tell!